From experience we Thai Yoga practitioners know that Thai Yoga reduces pain and that with reduced pain and corresponding inflammation many different improvements in function and structure become evident over time. It’s great to see validation of what both our traditions and our actual clinical experience show us every day. Thai Yoga offers better pain relief and with less, little or no adverse side effects than Ibuprofen and other NSAID’s. Additionally, pain relief from a short series of individual treatments has been shown to last as long as 15 weeks! SomaVeda® Thai Yoga provides solution for Osteoarthritus pain. The most common pain remedies prescribed for OA (Osteoarthritus) such as Ibuprofen and other similar NSAID’s such as Advil, Motrin and the like, come with a hefty price tag in respect of unwanted effects and side effects. Generally prescribed for relief of pain, swelling and inflammation. I was first introduced to the concept of “tapping” to balance energy in the meridians by late Grand Master of Thai Medicine, Aachan Boontum Kitniwan in 1988. In 1991, I was introduced to a Japanese variation by master of Shiatsu, Toshiko Phipps. The initial techniques Toshi introduced to me were performed with a little wooden hammer and a wooden probe. We would do a pulse and or Hara assessment to determine which meridians and corresponding points would need balancing and then apply the probe and tapp it with the hammer. Toshi also related to me that it was her understanding that originally the technique was part of Tibetan and Chinese acupuncture. My feeling and understanding of what these various masters told me is that the use is quite ancient and was practiced in some form or another throughout Asia and Southeast Asia. June 12th. to July 8th. 2015: The Oklevueha Native American Church of SomaVeda: SomaVeda College of Natural Medicine and Thai Yoga Center located at the ONACS Sancturary in Brooksville, Florida. Graduates completed the ONACS Seminary: Thai Yoga Center, 200 Hr. 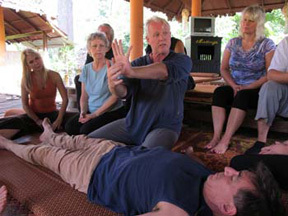 SomaVeda® Thai Yoga Therapist Practitioner Certificate program. Additionally, CTP 2’s completed their separate Intermediate qualifications and course work. Lead SomaVeda® Thai Yoga Certified Teachers were Aachan Dr. Anthony B. James, Khruu Dr. Julie James, Khruu Daniel Kram. This amazing SomaVeda Integrated Traditional Therapies®: Thai Yoga,Thai Traditional Massage, Ayurveda, Yoga Therapy and Natural Medicine pogram was also attended by elders and medicine persons of ONACS Buckeye Farm (Tennessee).